"I look forward to witnessing the exciting times ahead for the company founded by my grandfather and his brother 115 years ago," he said. 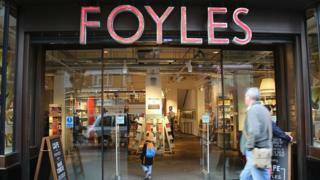 Why is Foyles' Charing Cross Road shop famous? Foyles original store was something of a mecca for booklovers, drawn by its history and the promise of browsing the vast stock, in what was once the world's largest bookshop. And it has boasted a star-studded clientele, including film actor Richard Burton, who once pilfered books from Foyles and was later horrified to discover that his then wife Elizabeth Taylor - taking a leaf out his own book - had stolen a copy of A Shropshire Lad by poet Alfred Edward Housman. "It's the first and last thing she ever stole in her life, except, of course, husbands," wrote Burton. But as Agatha Christie wrote in The Clocks, it was as if the books "had run wild and taken possession of their habitat". Mr Daunt said the acquisition of Foyles would leave the company "stronger and better positioned to protect and champion the pleasures of real bookshops in the face of Amazon's siren call". He said good bookshops were rediscovering their purpose "in the fight-back against online and e-reading".